Elmhurst first came to Liberty to discuss outreach strategies for their continuing education programs. Specifically, they wanted to reach healthcare, education and business professionals in their local area to invite them to an informational open house. Knowing that a broad target audience posed budgetary and logistical concerns, we proposed a holistic overhaul of the messaging and the proposed mail piece. Instead of a normal sized direct mail piece, our mailing and data experts worked with our creative team to conceptualize and execute a piece with 4x more messaging space for about half the cost. 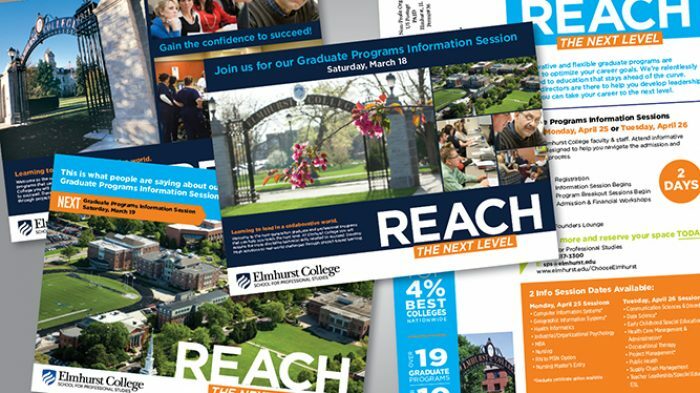 To reach Elmhurst’s five surrounding communities with traditional design and mailing methods would have limited their reach to 35,000 post cards — and maxed out their project budget. With Liberty’s strategy, design, print and fulfillment, they were able to reach 95,000 homes while staying within the same budget.